Christmas surprises are just the best! I came home to a surprise package from BornPrettyStore. It was full of Christmas cheer with stamping plates and nail water decals. Fun Fact: This is my first time using water decals! They're so easy and they give you a great design without the hassle. I painted two coats of Motives Nail Lacquer - Red Stiletto and let them dry completely. When using water decals you simply cut them out, let them float on a water surface for one minute and slide the decal off the paper. You have about one minute to place it, orient it, and work out any air bubbles before it dries. Finish it off with a top coat and you're all done! LiveLovePolish is an online store that carries some of your favorite brands such as China Glaze, Models Own, Floss Gloss, NCLA, and Seche. Seche Vite may be one of your favorite polish top coats, but did you know they have a whole line of beautiful colors? 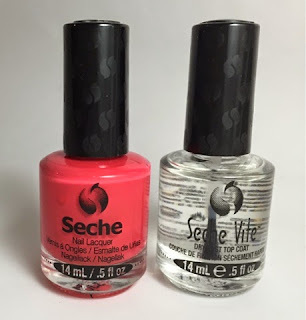 I received Seche Vite Dry Fast Top Coat and Seche Coral, a hot pink creme, from LiveLovePolish. As a nail artist who specializes in hand painting, cremes are my favorite! They make beautiful bases for art. I am sick of the freezing weather we've been having so I decided to brighten up my day a bit. These hand painted daisies complement Coral beautifully! 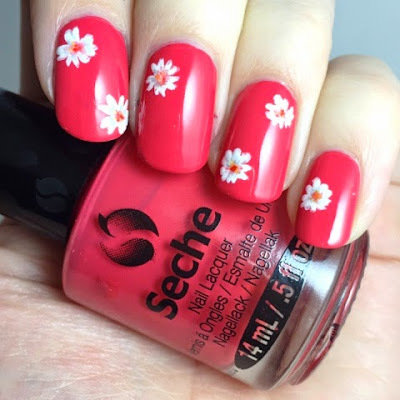 Seche's formula is wonderfully smooth and incredibly easy to apply. I did notice that Coral dried a bit darker than the vibrant shade seen in the bottle. Not a huge problem when the formula is so lovely! Check out LiveLovePolish! Which brand do they carry that is on your favorites list?